In our family, we like to believe that the first Vikings ventured west across the stormy Atlantic not to settle new lands in North America, but because they needed a vacation. We're not talking a visit to Uncle Ohlaf's castle, but a real vacation surrounded by white sand beaches and crystal blue water. So join us on spring break this year and try some of our favorite island treats - with a Danish flair of course. Viking Vacation Crown Cake — $22.99 This moist and flavorful crown cake is right out of the tropics. Our recipe is a perfect blend of sweet spiced rum and then swirled in a wonderful mixture of cane brown sugar, golden walnuts, and caramelized coconut shavings. 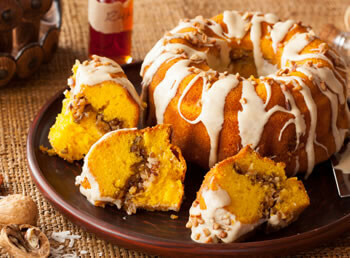 It's then finished with a decadent cane brown sugar glaze and sprinkled with pecans. It will be enough to say "Keep 'em coming!" 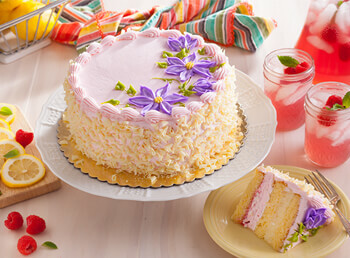 Raspberry Lemonade Mousse Cake — $69.99 As the spring days begin to get warmer, we are reminded of our childhood where we would spend all day outside. The only break from the activity was provided bya cool glass of Raspberry Lemonade. This cake is inspired by those days and is made with lemon yellow cake and layered with lemon custard and raspberry mousse. It is then beautifully hand decorated for spring.